Today I'm reviewing a nifty little product that has fast become a bit of a life saver. 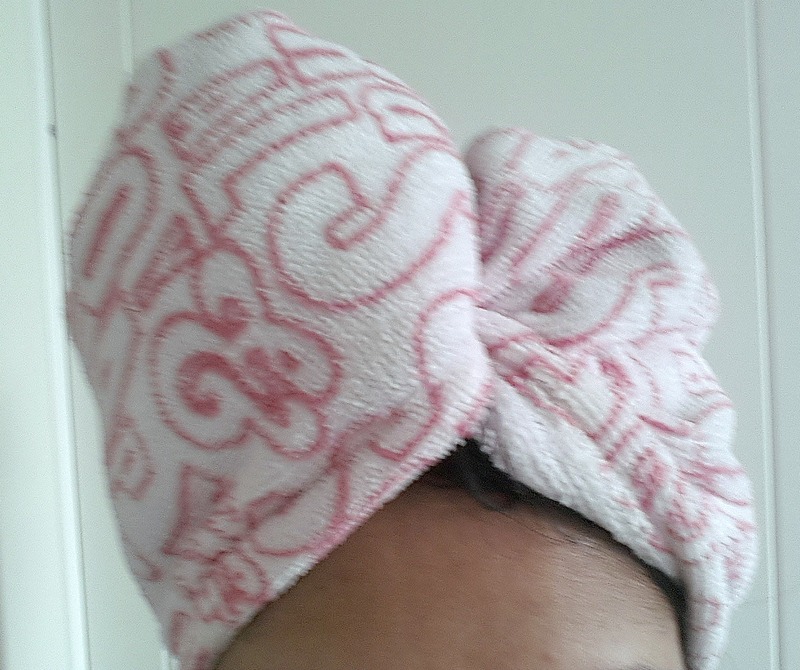 The Soap and Glory Hair Turban is something everyone should have in their arsenal. Let me just apologise for the quality of the pictures in today's post. The angles and lighting were just a mess! Sorry! A hair turban is basically a micro fibre towel that absorbs the excess moisture out of wet hair. It does not dry your hair. I want to make that very clear. You will not find that after an hour of wear, your hair is dry. However, it certainly speeds things up. After 30 minutes of wear, my hair is damp and dries in a hour or so. After 2+ hours of wear, my hair is damp and dries in about 20-30 minutes. The main difference between a micro fibre towel and a regular towel is that it absorbs more water and doesn't feel heavy on the head. The Soap and Glory one feels lovely and soft yet weightless. Despite being weightless, it is very secure. I can quite literally shake my head and it does loosen. It's also very well made and washes well. You can put it on a 40 degree cycle in the washing machine. I tend to do this every few uses. To use it, you simply tip your hair upside down, put the towel on, with the section with the button being at the base of your head. Twist the part that's in front of you around, pull it up and over and secure it with the button and toggle. Easy. At least it is in reality. That explanation has probably confused you! Hopefully you can see what I mean in the picture from the packaging below. This is a really good hair tool. If you air dry your hair on a regular basis or it normally takes a while to dry, then I high recommend spending the £7.50 on this wonderful invention. Well done Soap and Glory, well done! Have you tried using a micro fibre towel to dry your hair?